Umm…not quite. The Autodesk end-user license agreement (hereafter referred to as the “EULA”) restricts license usage to the country or territory of purchase. 2.1.3 Territory. Except as otherwise authorized in writing by Autodesk, the licenses granted in this Agreement are granted only for the Territory. Nothing in this Agreement permits Licensee (including, without limitation, Licensee’s Personnel, if any) to Install or Access the Licensed Materials outside of the Territory. Extra Territory Rights – Allows usage of a license outside of the country of purchase for up to 90 days per a year. This benefit can be used by End Users. No companion license would be needed, however if installing outside the country of purchase and requiring a manual install, explanation of benefit may be needed. 33. “Territory” (a) means the country, countries or jurisdiction(s) specified in the License Identification, or (b) if there is no such License Identification, or no country or jurisdiction is specified in the License Identification, means the country in which Licensee acquires a license to the Autodesk Materials. If the License Identification specifies, or Licensee acquires the Autodesk Materials in, a member country of the European Union or the European Free Trade Association, Territory means all the countries of the European Union and the European Free Trade Association. 14. “License Identification” means one or more designations by Autodesk that set forth the License Type (among other things) for Licensee’s license of the Licensed Materials. The License Identification may be (a) located (i) in the Licensed Materials (e.g., in an “About” box, license information dialog box, or text file of Software), (ii) on or with Autodesk packaging, or (iii) in a written confirmation or other notice issued to Licensee by Autodesk and transmitted via email, facsimile, physical delivery, or otherwise, or (b) obtained from Autodesk on request. For clarification, License Identification does not include a designation, confirmation, packaging or other document provided by a Reseller or other third party. If I purchase a product from one country’s store, can I use it in another country? No. 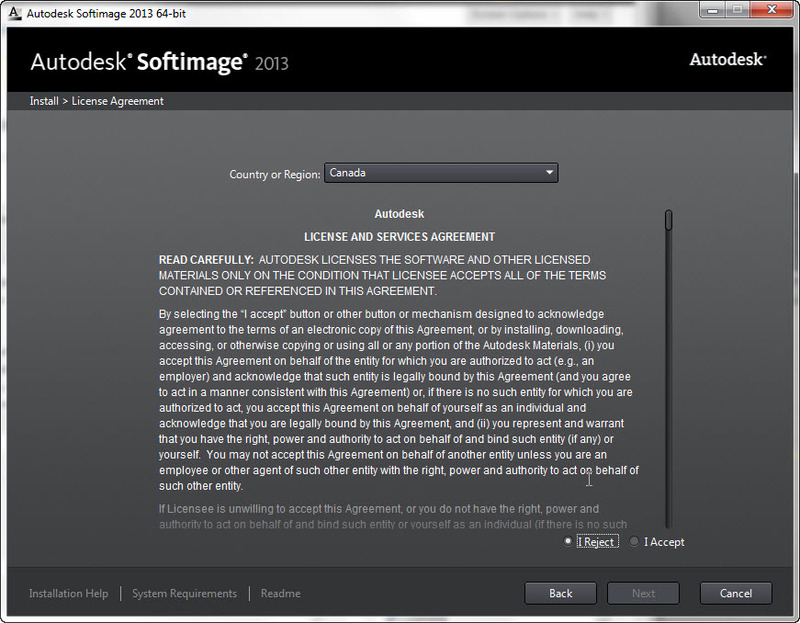 Software products purchased on this Store must be used in accordance with the terms of the Autodesk License agreement accompanying them; such terms include a restriction that the products may not be used outside of the country of purchase. For this site, the Territory for sale of software products is the US, Canada, Puerto Rico and Guam. Please see the Digital River Terms and Conditions. Finally, via google, I found this “Ancillary Service Description for Use Outside Territory” document. This entry was posted in Licensing and tagged EULA, Licensing, Softimage by xsisupport. Bookmark the permalink. I have to say this is one of the most obnoxious licensing clauses in the CG world. People travel! Its 2012 people move countries a lot these days for work. I have moved countries twice as a small content creation company we have 2 entertainment suites and a single SI licence and Mudbox license. Frankly when I company starts to dictate where I can have my workstations setup is frankly we start not giving a f^&k about clauses like this. Autodesk needs to get in touch with some modern lawyers to append there licensing. As it stands currently, you would use Subscription if you needed to move around between countries (or at the enterprise level, get a global license that isn’t restricted by the same EULA). Ah ok.. I retract my rant! haha… we are on subscription but still stand by my pent up licensing rage!… love this blog! …as the answer would be “subscription”, obviously, , but that’s besides the point. What I meant was buying the software online, while being “offshore”.